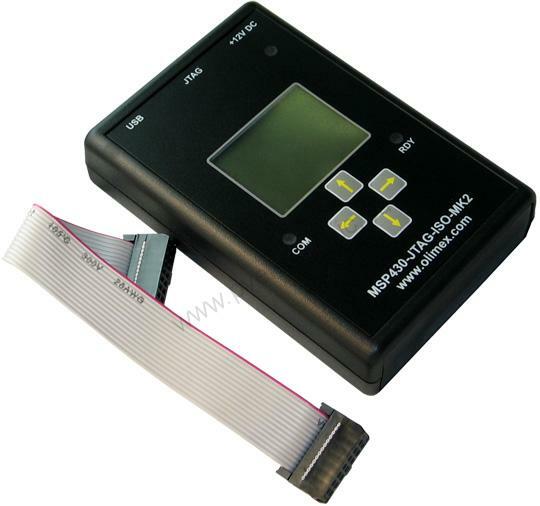 MSP430-JTAG-ISO-MK2 is a faster and improved version of our popular MSP430-JTAG-ISO isolated programmer/jtag. Now it's even faster, has a 2GB flash inside, file system, can measure the power consumption of the target and provides power profiling of the target. FEATURES: • program all MSP430Fxxx flash microcontrollers • ultra fast programming 14KB/s faster several times than TI-USB-FET (1.4KB when spy-bi-wire) • uses TI standard 2x7 pin JTAG connector • Spy-Bi-Wire support for the newest TI MSP430 devices • Can burn the MSP430 JTAG security fuse • optoisolation 1000VDC, target circuit can be high voltage powered (electricity meters safe debugging) • can supply target with variable voltage and can measure the target power sonsumption in range 10 uA - 300 000 uA • 2GB internal Flash - can work stand alone (with external power supply +12VDC), mass storage file system can hold multiply target codes inside • can work without computer in-field for firmware upgrade • MSP430.dll makes it compatible with all existing software which works with TI-USB-FET (emulates TI-USB-FET) compatible with all MSP430 programming and debugging software • outer dimensions of the box - 110 x 75 x 25mm ~(4.4 x 3.0 x 1.0") + 20cm (8") cable FAQ: Q: What should be the polarity of the external power supply jack? A: Inner pin is + there is protection diode so you can't go wrong. Q: What is the maximum input voltage for the external power supply jack? A: There should be 12VDC regulated voltage with 500mA current source, if more voltage is applied this will overheat the internal DC/DC isolation converter, the voltage should not exceed 14VDC in any case as it will damage the unit. Q: How safe is to debug with my USB port what is the insulation voltage? A: You can connect MSP430-JTAG-ISO-MK2 to high voltage target and use with USB port connection, there is 1000VDC insulation. Q: Can I use MSP430-JTAG-ISO-MK2 with XYZ development IDE/tools? A: MSP430.dll which is provided with MSP430-JTAG-ISO-MK2 are 100% compliant to Texas Instruments MSP430.dll and will work with *every* development software which supports the original TI MSP430-FET and MSP430-USBFET hardware platforms, we have tested EW-MSP430, Rowley CrossWorks, our customers have reported sucess with MSPGCC. Q: At what voltage is target programing when MSP430-JTAG-ISO-MK2 is working in stand alone mode? A: If your target is not powered externally MSP430-JTAG-ISO will power it up with 3.3V, if target is powered MSP430-JTAG-ISO-MK2 will detect and follow the target voltage. Note that your target voltage should meet Flash programing minium voltage otherwise you will get error during programming. Q: Other companies charge money for MSP430 programming software, why yours is free? A: To write MSP430 programming software using the TI MSP430.dll is very easy job, there would be probably tons of such programmers available if TI was not keeping the DLL content secret. The programmer software we offer is beta testing software so it may have bugs although we use it for years in house. Now we decided to release it for the public as we got number of request if we know for such software :). As we are more hardware company than software and we never got involved in sales of software we decided just to release it as freeware and not hassle with software copy protections and such.Note that it's not open source but copyrighted software, but it cost you nothing to obtain or distribute it. We are going to fix all reported bugs in timely manner but keep in mind that it's not commercial project and our peoples have lot of other stuff to do.